Goalies playing in the National Hockey League during any given time period are often defined by the tide of League scoring in their era. Whether it be the high-scoring 80s or the neutral zone trap game of the mid-90s, most goalies have largely been considered products of their time. In recent years, the NHL has made efforts to increase scoring and capitalize on the younger, more prolific goal-scoring generation entering the League nowadays. I’ve opined on some of these efforts before, such as in analyzing the effectiveness of streamlining goalie equipment. 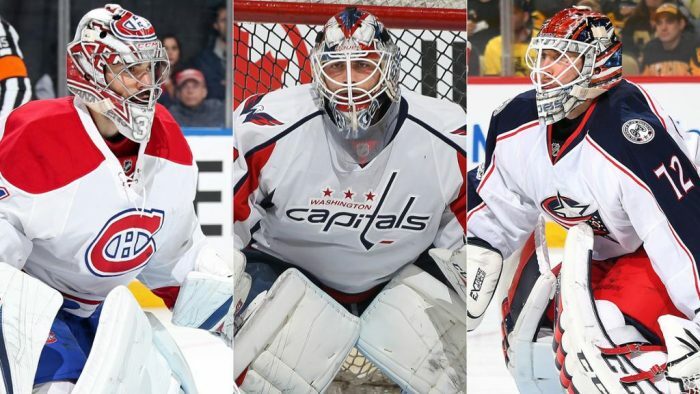 At the midpoint of this 2018-19 NHL season, league-wide goalie stats would suggest that the NHL is entering a new era of scoring, and goalies are allowing more and more goals in the process. Here’s an in-depth look at some of the factors affecting these numbers. When it comes to evaluating goalie stats at the midpoint of this season and why they have been so…well, average, there’s a lot to unpack. Hockey is a game of bounces, and many a time, the course of a game or a season can change seemingly erratically. With respect to this fact, the NHL often undergoes trend-setting seasons that give fans a glimpse of what to expect in the years to come. The 2018-19 season has been one filled with lots and lots of goals so far. Virtually every goals-related stat is up, and every saves-related stat is down. There are more players scoring more points, and more goalies letting in more goals night in and night out. The fast-paced, high-scoring action on TV most nights is almost a complete 180 from what the NHL looked like as recently as five years ago. To put it all in perspective, let’s break down team stats for goals per game (GPG). For the sake of the article, we’ll assume every team has played exactly half their season’s games (41), although in reality, they range from 40-43 GP at the moment. All stats are current at the time of this writing. At the 41 GP mark of the season, there are currently 12 teams who have scored 130+ total team goals, good for roughly a 3.17 GPG rate. Furthermore, there are currently 4 teams who have scored 150+ total team goals. That’s good for roughly a 3.65 GPG rate. 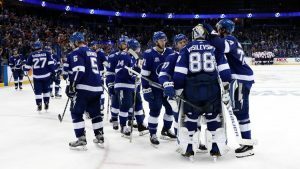 Leading all teams across the NHL in the GPG category is the League-leading Tampa Bay Lightning, who have scored 173 total team goals, an astounding 4.11 GPG rate. Even the worst team in the League, the Los Angeles Kings, have scored 97 total team goals– good for roughly a 2.25 GPG rate, which may seem low, but is close to their goals allowed rate. What really stands out is that teams aren’t just scoring goals, either– they’re allowing them, too. To date, there are currently 11 teams who have allowed 130+ goals, and every team has allowed at least 100+ goals so far. Evidently, as player scoring increases, so does the Goals Against Average (GAA) of goalies on every team. This copious scoring rate has placed seventeen of the 31 teams, more than half the League, at an even or negative goal differential at this point in the season, a glaring contributor to the unprecedented parity in League standings this year. So, how do we determine the cause of an increase in scoring in all game situations? Isolating special teams percentages could help to back up the notion. As it stands, there are currently 11 teams with a power play percentage of 20% or higher. That means that a third of the NHL is able to capitalize on 1 of every 5 man advantages they are able to draw. That’s pretty solid. Tampa Bay again leads this category, with a ridiculous 30.1% success rate on the PP. That means they’re good to score on 1 of every 3 PP opportunities they get. Although the argument may arise from some analysts that midseason goal-related stats aren’t always reliable and stalwart, this abounding a goal rate isn’t ordinary. Goals per game are up to 3.06 from 2.97 just a year ago, a dramatic increase, and the highest in 13 years since the 2005-06 NHL season, when the number finished at 3.08. Teams have combined for a 0.62 power play goals per game rate, up from 0.61 PPG last year, and the highest in 10 years since the 2008-09 NHL season. Oddly enough, shots against per game are down instead of up (31.3 SA), a slight decrease from 31.8 SA last season. This means teams are scoring more goals on roughly the same amount of shots, however, even a bit less. In turn, goalies have been affected, too. League average GAA is currently at 2.86, and League average save percentage is currently at .909. That means that the average starting goalie in the NHL right now is good for a 2.86 GAA and .909 SV%. In years past, those are numbers that would have sent you packing. Naturally, the more appearances a goalie makes, the more likely their SV% is to go down. Look no further than Delia’s .952 SV% in 4 GP, a historically unsustainable number. Look, then, at the other mentioned goalies. Laurent Brossoit. Robin Lehner. John Gibson. Save Gibson, each of the goalies listed above have never been in the conversation for the upper echelon of goalies in the NHL. So where are the household names usually sitting atop these charts? Separate Vasilevskiy, Rinne, and Rask from the bunch, and you’ve got a handful of woefully average goaltenders. A .912 SV% in years past would not have been good enough for a team atop the NHL standings, nor would it have sufficed over the course of a playoff run. 2018 Stanley Cup Champion Braden Holtby’s .910 jumps out immediately, as does 2-time Cup winner Jonathan Quick’s .902. Each of these goalies listed above is struggling, for whatever reason, to keep up with the rate of scoring in the NHL this season, and it shows. Contrastly, as mentioned before, more players are benefitting from the new style of play being exhibited on a nightly basis. There are more players with astronomical stat lines through 41 games than ever before. Currently, there are 5 players with 60+ points, 13 players with 50+ points, 40 players with 40+ points, and 25 players with 20+ goals. Leading the NHL in scoring is Nikita Kucherov of the Lightning, with 69 points. He also leads the League in assists. All in all, it appears as if goals are being scored at a rate never seen before in the NHL. Players are banking more points across the board, and goalies and their numbers are suffering because of it. Halfway through the season, it’s hard to predict whether or not these numbers will fluctuate, if they will go up or down, and by how much. 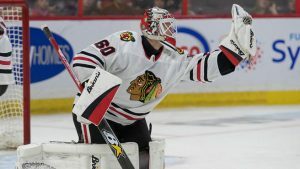 What is clear is that all the numbers are trending toward a new era of scoring in the NHL, and conversely, a new era for goaltenders.